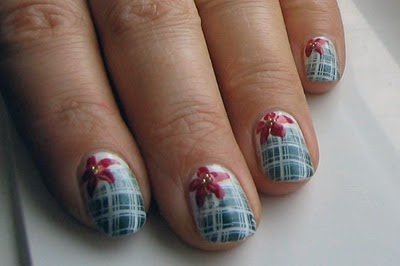 Frippery Digits: Two Christmas Manis! This first one I used 2 coats of Claire's Snow Ball for the base color, then sponged some Revlon Emerald City matte suede polish onto 3/4 of the nail towards the tip. 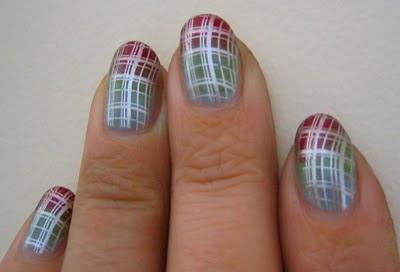 Then I went over the whole nail using the plaid pattern from image plate plate m60 and Konad special polish in white. This made it look like the white at the base of the nail turned plaid over the green. Then I made little poinsettia flowers with Sinful Colors Sugar Sugar and I used some of my new gold bullion beads for the first time! When the topcoat went on all the hidden shimmer in the matte green polish popped up under the white plaid. Too bad I couldn't take a good picture of the glimmer on the nail but the macro on my camera is seriously lacking. This is the mani I am currently sporting. I used 2 coats of Claire's Rain drops as a base color, then sponged on Sinful Colors Show Me The Way (pretty grassy green shimmer) 3/4 of the way up the nail. Then sponged Sinful Colors Sugar Sugar onto the tip of each nail, so the nail fades from grey at the base to grassy green to deep red. After this was dry I stamped using Konad image plate m60 with a plaid pattern. I used Sally Hansen Chrome Crystal so it pops. The photo doesn't do it nearly enough justice. I wanted to leave everyone a note to say that I am getting ready to fly home to the Yukon for Christmas and won't be back until mid January. I hope to be in with at least one more post before the New Year but things might get too busy. I do hope to be doing a bunch of guest manicures while I am home for the holidays so I promise I will take photos for posts in the new year. Wishing you all the very best during the holidays and all year round. Merry Christmas! Peace be with you. This is gorgeous, did you use a striper for your flowers because they turned out amazing! I really like the poinsetia mani. You did a great job on both of them! I can never stamp that pattern 100% perfectly! Both very cute and Christmasy. Have a merry Christmas! Danielle: Thank you! I was pleased at how the patterns went on this time around! Getting better. Still a few places where the whole pattern never transferred and I had to sort of plug some in later. The first one stole my heart - the second didn't even have a chance! Have a wonderful time at home! I totally agree with ABOP. I just love the first one<3. love it so much.. well done.. I loved the first one too. It definitely outshines the other one, which could be work any time of year. Thank you everyone for your comments! 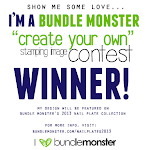 You've got mad skilz woman! :D Love the little poinsettia's. Enjoy your trip home to see family. Can't wait to see what you come up with while you're gone. Safe travels!